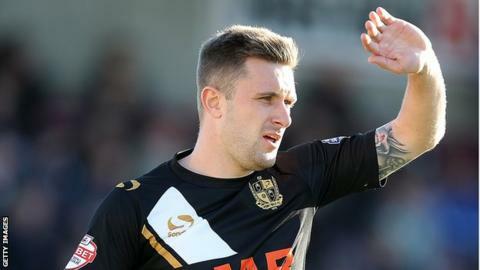 Strikes from Mark Marshall and Colin Daniel helped Port Vale secure their first away since August at Colchester. After a goalless first half winger Marshall netted by meeting Adam Yates's cross before turning provider for substitute Daniel, who scored less than a minute after coming on. Freddie Sears scored from two yards out for Colchester with 12 minutes to play to set up a nervy finale. However, Vale held on to earn a second successive League One victory. Match ends, Colchester United 1, Port Vale 2. Second Half ends, Colchester United 1, Port Vale 2. Elliott Hewitt (Colchester United) wins a free kick on the left wing. Freddie Sears (Colchester United) wins a free kick in the defensive half. Ben Williamson (Port Vale) wins a free kick in the attacking half. Michael O'Connor (Port Vale) is shown the yellow card. Sean Clohessy (Colchester United) wins a free kick on the right wing. Attempt missed. Gavin Massey (Colchester United) right footed shot from the centre of the box misses to the left following a corner. Corner, Colchester United. Conceded by Richard Duffy. Attempt blocked. Sanchez Watt (Colchester United) left footed shot from the centre of the box is blocked. Corner, Port Vale. Conceded by Elliott Hewitt. Attempt saved. Freddie Sears (Colchester United) right footed shot from the right side of the box is saved in the centre of the goal. Goal! Colchester United 1, Port Vale 2. Freddie Sears (Colchester United) right footed shot from the left side of the six yard box to the bottom left corner. Substitution, Port Vale. Louis Dodds replaces Mark Marshall. Mark Marshall (Port Vale) is shown the yellow card. Foul by Mark Marshall (Port Vale). Corner, Port Vale. Conceded by George Moncur. Gavin Massey (Colchester United) hits the left post with a header from the left side of the box following a corner. Attempt saved. George Moncur (Colchester United) right footed shot from outside the box is saved in the bottom right corner.